I wanted to choose beautiful, soft colours that would be appropriate for any occasion and any season. 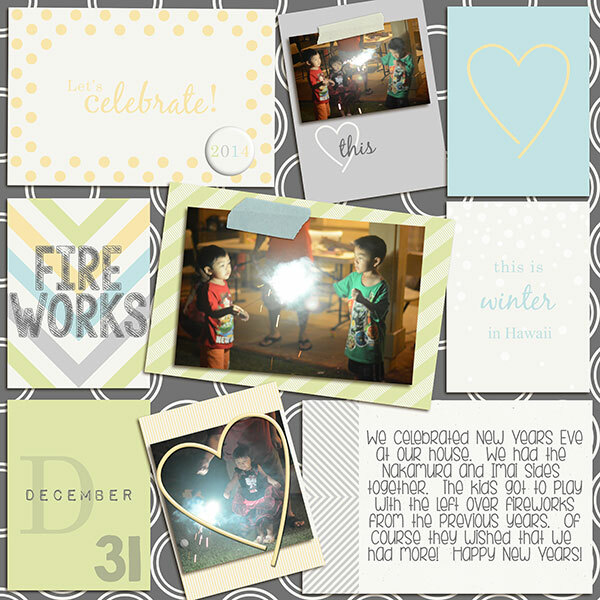 The cards, word art, elements, and papers are versatile enough to be used for digital, hybrid, or pocket scrapbooking. They are all designed with 300 dpi and offered as .jpeg or .png files for use with any scrapbooking software. The Project Life cards that make up the bulk of this kit are sized at 4×6 and 3×4 for easy printing and sliding into album pockets if that is your preferred method of memory keeping. The following layouts are from two fellow designers who were kind enough to play around with the Hello 2014 winter kit and share their beautiful pages. The next three editions: spring, summer, and fall, will be offered throughout the year in the same colour palette and offer seasonal papers, cards, and elements. These digital kits can be used to design individual layouts or create a full year family album or photo book. The latter option is what I plan to do, of course, but I will discuss more about that in a future post. Until then, enjoy the free kit and please share any layouts that you create because I would love to see them!